Born and raised on the West Side of Chicago, Ashley Ellis (pronouns: she/her/hers) has a mission to be a conduit of healing and transformation with young people. She is currently the Founder and Keeper for B.R.E.A.T.H.E Circles, where she is pioneering New York City based Peacemaking Circle Keeper Trainings that are accessible for youth, schools, community memebers and credible messengers. She is a also a youth advocate for young people involved with the juvenile Justice System. Using her experience working with system involved young women, along with the foundations of restorative justice and Peacemaking Circles, Ashley created a program called B.R.E.A.T.H.E: Circles for My Sistas where she strives to provide gender specific, sacred healing and restorative space for young women of color to be Balanced, Restored, Empowered, Affirmed, Transformed, Healed, and Embodied. Ashley has attained her Master of Arts in Urban Youth Ministry at New York Theological Seminary in May 2017. She is currently pursuing her Phd in Women’s Spirituality from The California Institute of Integral Studies. 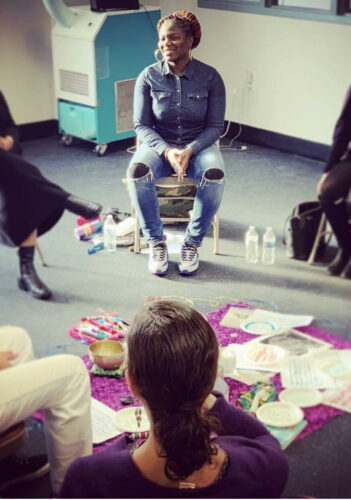 Using a womanist integral spirit centered approach and pedagogy, she strives to create holistic spaces that communicate a message of Love, Connectedness, Hope, Faith, Restoration and Transformation with the goal of bringing healing to not only our youth, but to our communities locally and globally in a profoundly dope way!